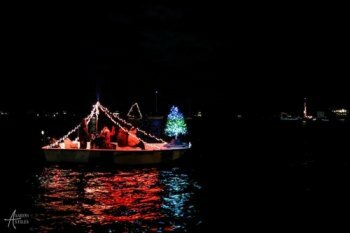 Ocracoke's Harbor Lights Boat Parade is set for Saturday, November 24th. Kick off the Christmas season with a beautiful flotilla of lighted boats. On Saturday, November 24th at 5:30pm, boats will set the harbor aglow, and spectators can watch from the Community Store docks and enjoy complimentary refreshments at the Working Watermen's Exhibit, starting at 5pm. Boats small and large are welcome! Ocracoke watermen, kayakers, sailors, fisherfolk, jet ski-ers – all are welcome to join in the fun and light up the waters of Silver Lake. Running lights are already red and green, so the Christmas theme is easy! 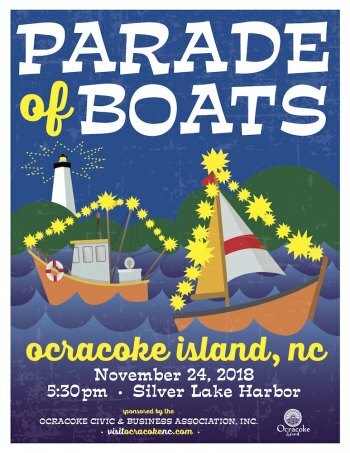 In 2016, Ocracoke Civic and Business Association brought back an old holiday tradition: the parade of boats in Silver Lake harbor. The first year, six boats participated, and over 50 people joined in the fun at the Watermen's Exhibit. In 2017, eight boats paraded around the harbor, while over 150 people watched from the Community Square docks. Others gathered all around the harbor to see the small but festive display of holiday cheer. "It's just a simple and fun way to celebrate Thanksgiving weekend, and start the Christmas season," said Teresa O'Neal who organized the event's comeback. Please let Kathryn Waldrop (201-323-0073) or Sundae Horn (921-0283) know if you want to participate with your boat or have any questions.